Today, the Bundestag’s Budget Committee has approved two budget requests worth more than 25 million euros from the Federal Ministry of Defense, with a total value of around 428 million euros. All Bundeswehr procurement projects whose total volume exceeds 25 million euros must be approved by the Budget Committee. All of these projects are already earmarked and approved in the federal budget. However, they require the separate approval of the Committee on Budgets. 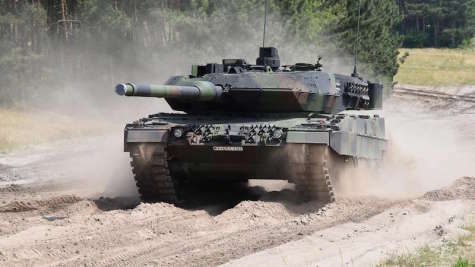 101 Leopard 2 main battle tank variants A6M A2 and A6 are to be upgraded to the latest Leopard 2 A7V version. The aim is to standardize on the Leopard 2 A7V to simplify operation and logistics. The standardization of the systems is required with a view to effective and low-risk personnel deployment. The crews must be able to fulfill their mission even under extreme conditions in stressful situations. Therefore, tank crews must be able to perform all mechanical operations during combat operations completely automated. Furthermore, the crews must be able to be replaced at any time. The modernization of the main battle tanks should be completed by 2026. Among other things, the Leopard 2 will receive a new target system, new radios and modified fire control computers. Furthermore, the Budget Committee gave the go-ahead for the procurement of around 32,000 rounds in 155 mm caliber the Panzerhaubitze 2000 self-propelled howitzer. The troops are to receive the munitions in a total of eight deliveries by 2023. The DM121 explosive device is designed to more effectively combat soft and semi-hardened surface targets, as well as infrastructure targets in the depth of the battlefield. The ammunition is crucial for the deployment of the Panzerhaubitze 2000, for example, for the same commitments as the fast NATO Very High Readiness Joint Task Force. The completion of the required inventory is necessary to compensate for usage and build up the minimum stockpile required by NATO.